The book jacket says that Ove is the grumpiest man you will ever meet. I would agree with that. It also says ‘isn’t it rare to find such old-fashioned clarity of belief and deed?’ In my first attempt to read Ove, I struggled to find that. The book jacket also says, ‘in the end you will see that there is something about Ove that is quite irresistible.’ I eventually got that. A Man Called Ove took me two attempts to read. Quite frankly, I was so irritated by him on the first reading that I gave up – couldn’t bear to be near him. Then the subject of Ove came up with friends. One gave up on Ove because it was so sad. One loved Ove so much because he identified with Ove. One loved Ove so much because of Ove. I hadn’t experienced any of those feelings, so I decided to give Ove another go. I picked up from the chapter that I’d abandoned him at, three chapters in. If I had stuck out one more chapter, it would have changed the way I felt about the book. Or, if the author had given more compassion earlier in the book, then I would have been more easily/readily hooked. What is A Man Called Ove about? It is a puzzling book, written with very short chapters that move back and forwards in time. Like pieces of a puzzle, you begin to build up a picture of the man Ove, his wife, Sonia and their marriage, and also their friendships. Ove is set in his ways, his routines, his beliefs, his way of being. I didn’t warm to him initially, but I was moved by him (in ways I cannot explain without spoilers; not my game.). Ove reminded me of the main character in the animation ‘Up’, Carl Fredricksen, perhaps because of some of the themes in both stories. One thing about Ove that did not ring true was Ove’s age. Ove is 59, yet presents twenty years older, closer to Carl Fredricksen. 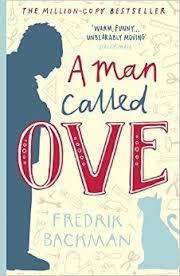 Reading A Man Called Ove was at times like being in a sit com. There are awful, cringe making moments in it (all Ove’s), but it is also brilliantly comic. It is easy reading, absorbing and moving. A Man Called Ove has themes running through it. Loss, grief, friendships, the sense of right and wrong, and, ultimately, about ageing. Backman shows the alienation and loneliness of ageing in Ove and his neighbours. These themes weave their way throughout the story, adding a dimension to the book that I was not really expecting from the outset (hence, the agreement with the last claim on the book jacket). There are many treasures like these scattered throughout the book, if you can get past the initial irritation of the man called Ove. Ultimately, I would recommend this book, thanks more to my friends who persuaded me to give Ove another go. I don’t regret it for a moment.